Our go-to cupcake frosting recipe. This one always gets rave reviews and doubles as a perfect cake frosting!! Cooks Tip: For best results with whipped cream, freeze your mixing bowl and whisk attachment 10-15 minutes before using. Also keep the heavy whipping cream refrigerated until ready to use. Whip the cream on high speed (1-2 minutes) until thick, fluffy and spreadable. Fold the whipped cream into the cream cheese mix. 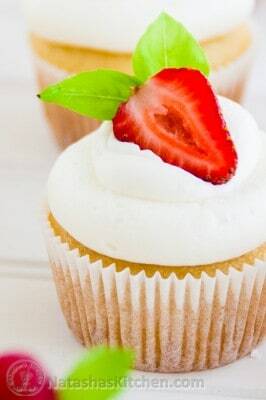 Keep it covered in the fridge until ready to use on these cupcakes.